Estimate the precision of the measurement procedure at a single site. Open the file tutorials\EP05-A3 Appendix A.xlsx. The worksheet opens showing 4 columns. The Sample column identifies the levels of the analyte in the sample (1 level). Day identifies the day number (20 days), Run identifies the run within each day (2 runs per day). Glucose (mg/dL) identifies the measured value for 2 replicates of sample in each run. On the Analyse-it ribbon tab, in the Statistical Analyses group, click Precision, and then click 2 Factor Nested. In the Y drop-down list, select Glucose. In the Factor A drop-down list, select Day. In the Factor B nested within Factor A drop-down list, select Run. In the By drop-down list, select Sample. In the Estimator drop-down list, select SD. In the Confidence Interval edit box, type 95%, and then in the Method drop-down list, select Exact / Satterthwaite. In the Conditions drop-down list, select Laboratory / Repeatability to label the innermost variance component repeatability and the outermost within laboratory. On the Analyse-it ribbon tab, in the MSA group, click Variability plot. On the Analyse-it ribbon tab, in the MSA group, click Identify Outliers. The variability plots show a simple visual assessment of the closeness of agreement between the measured quantity values. 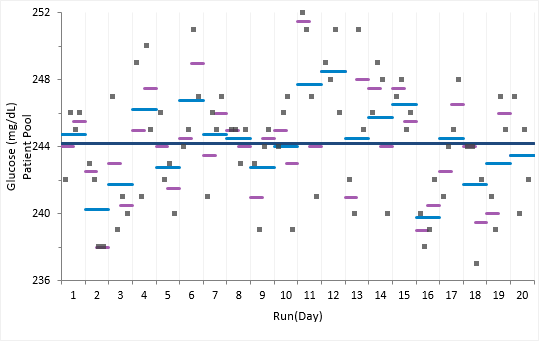 The purple lines show the mean of each run, the light blue lines show the mean of each day, and the dark blue line the overall grand mean. You should observe the scatter of the points to ensure there are no obvious problems. No points stand out as atypical relative to the bulk of the data, and there are no discernible trends (such as drift). Note: To see an example of a dataset that contains outliers and how to deal with them see the EP15-A3 tutorial. The abbreviated variance components table shows the required precision statistics expressed numerically as the standard deviation (SD) and coefficient of variation (CV). The detailed variance components table show the precision expressed numerically as the chosen measure of imprecision along with a confidence interval for each component. Note: You can change the imprecision to be expressed as SD, Variance, or CV and you can also change the method of computing the confidence intervals. We prefer the Exact / MLS method as the coverage is closer the nominal level in most cases.